Beans: Giacomo, Guatemala, Santos, Colombian, Harrar, Sumatra. Out of the Grey – Giacomo: Background information. 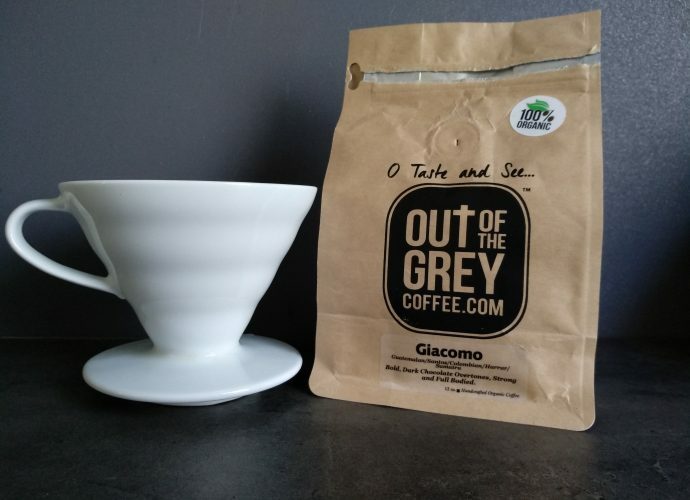 The Giacomo coffee blend belongs to a special line of coffee blends that are sold by Out of the Grey coffee. This special line is called the Artisan Blend line in which the coffee blends are given the names of famous historical figures. Botticelli, Modigliani, D’Enzo and Amedeo are names that a lot of you will recognize as famous Italian artists. 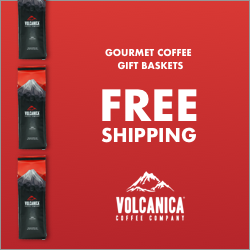 The Giacomo is also one of them and this blend consists out of coffee beans that come from Santos in Brazil, Ethiopia, Indonesia, Guatemala and Colombia. 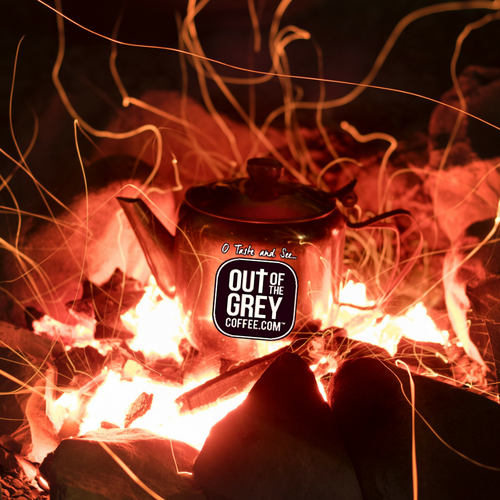 All those coffees are selected by Out of the Grey to form a perfect balanced blend, and we all know how difficult that can be. The coffees that are used in this blend are all 80+ coffees and 100% organic. Out of the Grey – Giacomo: Opening the package. 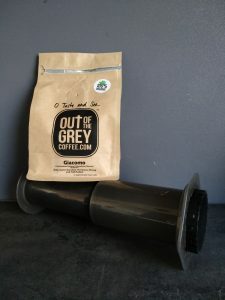 The coffee from Out of the Grey comes in the typical beige package with a de-gassing valve and a zip-lock. The front of the package is covered with the logo, some tasting notes and the varietals of the beans. On the back you can find some information about the roaster himself. On the bottom of the package you will find the roasting date. The coffee blend consists out of beans that a dark roasted and each have their own colour. This dark roasted blend has been roasted like a traditional Japanese roast. This means that you will not find any bitterness in the coffee despite the dark colour. When grinding the coffee I can smell the dark notes coming forth but it has a sweet note to it. 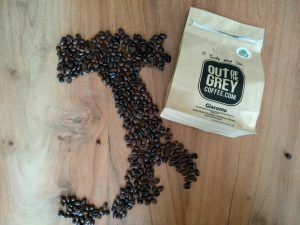 Out of the Grey – Giacomo: The Tasting. 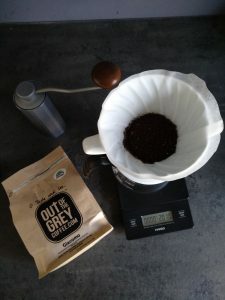 I reviewed this coffee on the Hario V60 and Aeropress. Although both brewers gave off excellent results, I do think that the dripper is the advantage. The Hario V60 simply gives off a more balanced cup in terms of flavors. When brewing the coffee, a lot of aroma’s appear on the nose. Toffee, caramelized sugar and sweet chocolate fill up the room. After the brewing is done I take sip of the coffee. The first thing that comes to mind is the flavour of sweet pipe tobacco. You can notice the sweet note of the pipe tobacco on the tip and side of your tongue. As I slurp the oxygen inside, caramelized sugar appears alongside the tobacco. When I swirl the coffee inside my mouth, I get the toffee flavour again, a little in the background but pleasantly there. 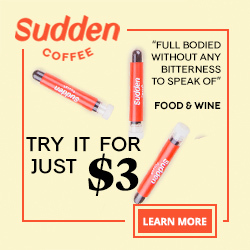 What I like about this coffee is the smooth and bold mouthfeel. There is no bitterness to be found in the coffee and the aftertaste is a nice tobacco and chocolate flavour that lingers. Out of the Grey – Giacomo: The verdict. The Giacomo is a nice blend that will do a great job on drip machines and the Hario V60. The smooth and bold mouthfeel is something you will also find in the Amedeo although that coffee is a little stronger in flavour and aroma overall. The sweet pipe tobacco, the caramelized sugar and toffee notes are very nice and make this a coffee to wake up to every day. In my opinion this is also a safe coffee to serve in your office since everybody is bound to like it. 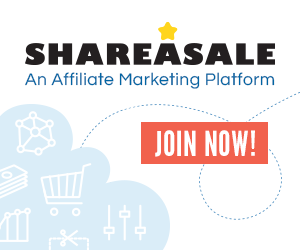 Check out THIS LINK to go to the website of the roaster. Next Post: Review: Out of the Grey – Haitian Neg Mawon.